Details: I made these socks a tighter gauge than the pattern calls for. They fit fine, except the top detail makes it hard to get over your heel. 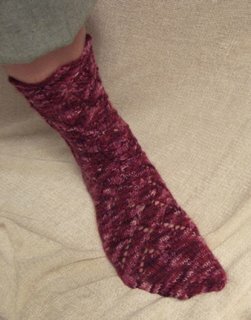 These may be the fitst socks I've knit for myself that's I'd wear. The pattern was engaging, but not for beginers. I didn't follow the chart to end the design near the toe since the directions were not clear on when to change.